Because ..... it is open virtually all of the time. According to an NRC inspector, an automatic sensor also opens a parking garage style lift barrier to any approaching vehicle. 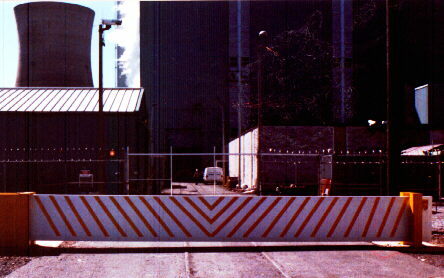 There were no vehicle barriers required at nuclear plants until 1994. Barriers were installed at TMI after a 1993 intrusion there. But, 12 of the 14 barriers are so close to the vital areas of the plant that an "Oklahoma-sized" bomb could cause a catastrophe. Blast deflection shields should have been erected as discussed by the NRC's Advisory Committee on Reactor Safeguards. Just after the bombing in Dhahran, Saudia Arabia, military security planners requested setback distances of 400 feet for buildings from vehicle pathways. In comparison, the barriers at TMI allow a pathway to ******** (building name withheld) where a truck bomb could detonate only 75 feet away from its target. A strong blast from this location would cause a sudden and deadly release of radioactivity. Two other vital area buildings (names withheld) have setback distances of 35 feet and 10 feet respectively. A bomb detonated at those sites could lead to a release only if other safety equipment fails or is damaged by the blast. Therefore, a radioactive release could be caused without attacking the reactor building. Nuclear Regulatory Commission Chairman Ivan Selin told a Senate Committee following the TMI intrusion and the World Trade Center bombing that damaging other equipment could be just as disastrous. The TMI intruder's vehicle went 63 feet into the turbine building. The Senators wanted to know if there was a potential for a release if the intruder had exploded a bomb. Selin testified, "If you have the bomb, you might have a fire, a lot of other things going wrong. It's exactly the time in which you wish you had all of your defense-in-depth available, because you're stressing the system." When pressed about the potential damage from a bomb, Selin said that a blast inside the turbine building and the resulting fires could have left the plant "skating on very thin ice." He explained that it could have caused a radiological release. Senator Joseph Lieberman told Selin that some of his answers were "hair-raising" and thought it would be worth the money to install vehicle barriers. Phillip Clark, President of GPUN (TMI), told the Senators that he did not consider the intrusion a breach of security. Downplaying the very incident which gave impetus to a federal hearing didn't settle well with the NRC Commissioner sitting behind and to the right of Clark. Nearly four months after the Senate hearing, Selin said in a press conference, "For all the weaknesses of security, power plants are still quite well protected compared to a lot of other attractive targets. But, the margin of prudence, the margin of confidence that we have is clearly frayed by the events at the World Trade Center much more than the penetration of Three Mile Island," attributed Selin. He explained that the NRC had previously assumed terrorists would not be able to assemble enough explosives for a large vehicle bomb and deliver it without advance intelligence by federal authorities. "The attack on the World Trade Center was a surprise. We can't rule out unexpected vehicle attacks," said Selin." Selin continued, "...the amateurization of the terrorism movement has led to a lot of people who either through bravery ignorance or some combination of the two, are willing to take much worse chances than professional terrorists would normally take. In the past we just couldn't rule out the fact that it's essentially a suicide attempt or a very risky attempt to drive a truck through a fence carrying large amounts of explosive, and to drive right up to the reactor building or into the reactor building and have an explosion." A reporter asked about the cost of vehicle barriers. Selin pointed out that some plants would have to expand the protected area out farther from the vital area. "There are a few plants where it will cost them a lot more because of geography, but they will have to do it regardless of what it cost them," Selin said. "The cost benefit analysis as we propose it, does not deal with an individual plant's cost of fixing its fence. Every plant will have to fix the fence. We looked at an average cost and said it seems to us to be worth it. If some plant has got poor geography and geometry and it has to spend more, it will have to spend more." He said, "We've satisfied ourselves that there is at least one -- or there are at least one or two solutions which are affordable, which are readily available. And if a plant comes up with some other idea, if they want to put in motes and alligators or something like that, that's there authority. We don't have an alligator inspector now, but I'm sure we'll figure out how to do it!" Selin gave the press the impression that he was committed to fixing the problem. Regrettably, the NRC has permitted conditions to exist where the setback distances and the lack of blast deflection shields have not precluded a deadly release of radiation due to a truck bomb. We have concluded that the vehicle barrier regulations are mostly "window dressing."